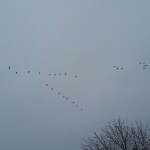 Overhead the Canadian geese are chatting amongst themselves, as they move in with the warmer weather. Happily, there are a lot of options nearby for them to land and feed in. Their chatting voices are by necessity rather loud since they need to be heard above the sound of the rushing wind, and since their v – shaped flying patterns keep them spaced very widely apart. I wouldn’t think there are very many intimate conversations going on, just stories about how grandpa used to love this place or how that place dried up like a desert last year, and instructions to the young ones to note that particular landmark. I rejoice in their sound since it means that at least one other species thinks that the weather is going to get warmer. Another sound of spring that cheers me is the pervasive sound of water trickling under the bottom of a plate of ice, of water whooshing through our downspouts, and rising in the ditches. It means that our blanket of 2 or 3 feet of snow is slowly, reluctantly, giving way to the sunshine. It is replenishing the aquifer gradually that flows beneath my farm, because we live in the country, and because this year it is melting slowly enough to be absorbed into the ground. I realize that the majority of you who live in cities probably miss a lot of these water sounds. So much of the ground is “developed” and paved over that the spring runoff goes directly to storm water collection systems. The smaller birds are getting noisy too – calling as they gather in large groups and then whizzing in twos to a new feeding patch. They’re getting ready for mating season, gathering energy for the frolicking ahead. Spring is a wonderful season full of anticipation and excitement. Around our place it also comes with mud and lots of winter hair, given up by its original owners and now sticking fiercely on every piece of clothing I own. I will take the good with the bad, the hair with the sun. I will appreciate every small intimate change in my surroundings! Spring is here!!!! Next PostNext It’s the Bees Knees!